ÖKO-POLO: THE ULTIMATE ECO POLO? 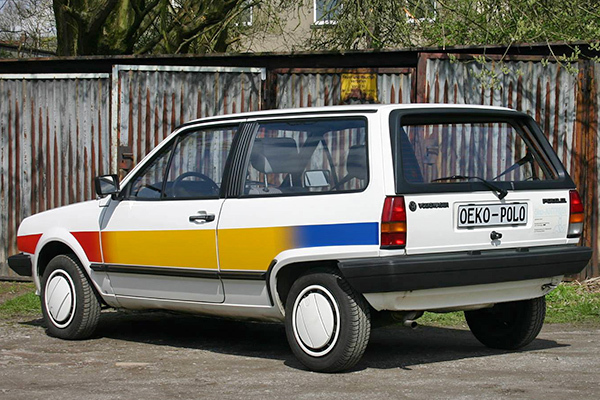 If Formel E showcased Volkswagen’s mainstream fuel-saving technologies, then the ‘Öko-Polo’ (‘Eco-Polo’) of 1989 really displayed what the company could do. Designed to travel 100km on 3 litres of fuel, the Oko-Polo was an ultra-economical car dish made up from some very interesting ingredients. It wasn’t dressed up as anything exotic, though: only rainbow stripes down the flanks and the Formel E’s rear spoiler gave the game away. 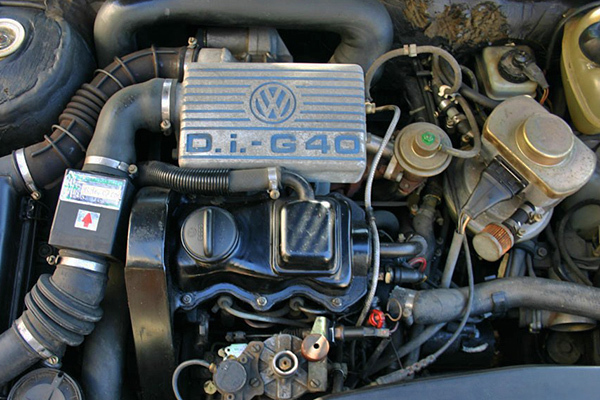 A two-cylinder diesel engine nestled under the bonnet, mated to Volkswagen’s patented G40 supercharger, as used in the high-performance Polo Coupé G40. 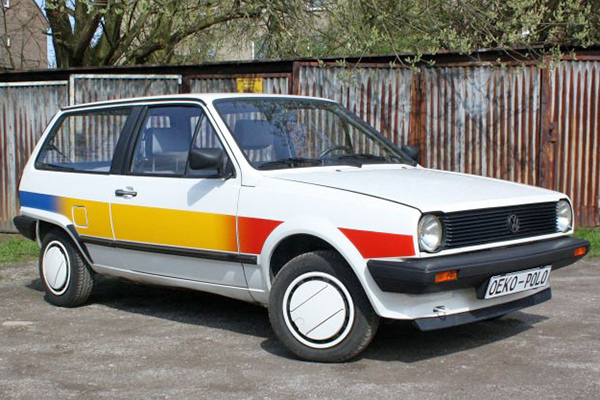 First seen in 1985, the supercharged and super-fast Polo was also sold in limited production runs in 1986 and 1987 and produced quite prodigious performance from its 1,272cc supercharged engine. 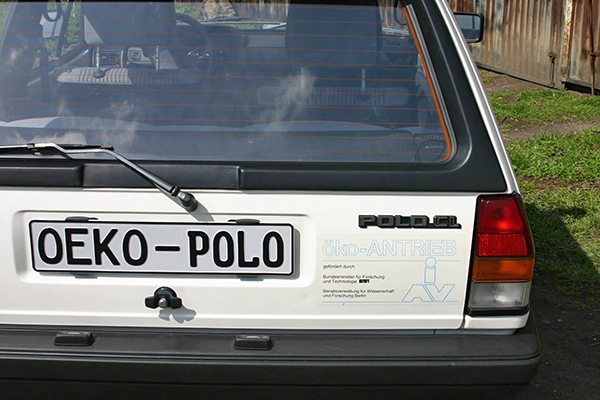 The Oko-Polo installation was for the same reason: to boost performance. The pair of cylinders of the (reportedly loud) 858cc engine operated simultaneously in a pumping action, while a special liquid iron oxide fuel additive was stored in a tank under the bonnet and was mixed with the diesel to allow it to pass through a unique catalytic converter under the car. Primarily aimed at tackling soot emissions, a particulate filter was also part of the Öko-Polo’s make-up and an exhaust gas recirculation system also played its part. The tiny engine was fitted with direct injection and a balancing shaft with counterweights to keep unwanted vibrations in check. The extra technology worked well, calming the unit’s inherent roughness considerably, with Volkswagen stating that the 0.9-litre unit was as smooth as that of a petrol-powered Citroën 2CV, which had a small-capacity horizontally-opposed ‘boxer’ motor. Yes, the drive-by noise may have been a little on the loud side, but VW claimed that the car produced no more volume than that of a contemporary 12-cylinder BMW 7 Series. Engine quietness was an obsession. Elsewhere, sound-deadening and heat-resistant foam under the bonnet did their best to quieten the diesel unit, and even the engine cooling air flowed through a sound-absorbing matrix to the cooler itself. As a concept which predated VW’s later Golf Ecomatic, the Öko-Polo was driven by a five-speed semi-automatic gearbox, which, like the economical larger car, had no clutch pedal. 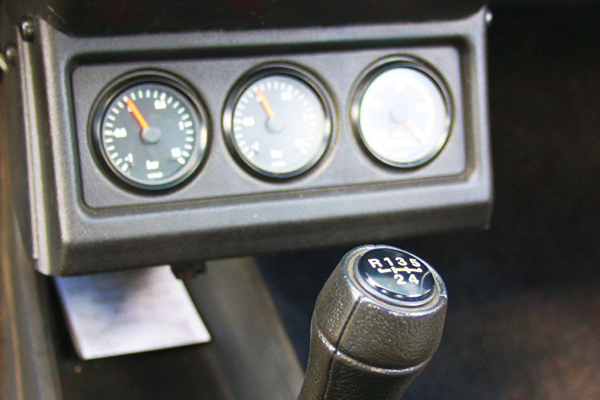 Instead, an electronically-activated clutch was controlled by a microswitch in the gear shift knob itself. Disengagement of the clutch occurred when the knob was lifted, and was re-engaged when the knob was pushed down again. Also shared with the Ecomatic was a system which disengaged the engine when the accelerator pedal was released, allowing the Öko-Polo to coast along, freewheeling. Savings of around 10 per cent of fuel were calculated just from this one development alone. As with stop-start systems of today, the engine started once more when the accelerator pedal was pressed. Only in this case, the re-application of the gas pedal also woke up the supercharger. Activated by an electric clutch, the blower added 20kW of power to the 9kW (12bhp) engine, resulting in a total output of 40bhp. Top speed was 85mph. All of the Öko-Polo’s technology did as it set to do, and then some. A test drive from Wolfsburg to Marseille resulted in fuel economy of 1.7 litres per km! The concept proved, 50 cars were sent out for field trials, with a further two prototypes built. 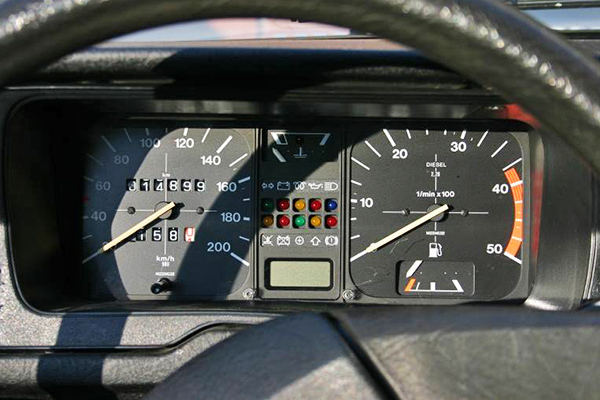 A handful of cars were also equipped with extensive data-logging systems. The early 1990s saw some cars dispatched to technical universities as part of a research programme partly coordinated by the German Federal Research Ministry. But, a series production run of this intriguing eco hatchback proved prohibitively expensive. Little heard of outside VW enthusiast circles, the Öko-Polo was a fascinating insight into Volkswagen’s environmental car development. While surviving examples can be found, they are very few and far between and quite often are missing the special components which make the Öko-Polos so unique. What this special car did do, however, was to set the template for future limited production (in terms of numbers sold) eco Volkswagens. Both the Golf Ecomatic of 1994 and the Lupo 3L TDI (3 litres of fuel per 100km, not a V6-powered city car!) featured the semi-automatic clutch-less gearbox idea and the exhaust gas recirculation and particulate filter was, of course, to feature on many environmentally-aware cars yet to come.